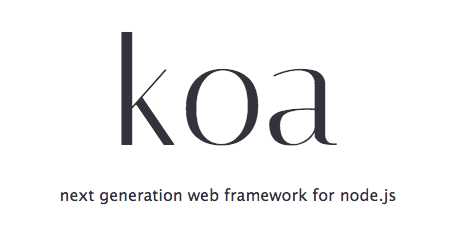 In late 2013, the team behind Express.js announced a new framework called Koa. It uses some features that require an unstable dev version of Node, but in this post I’ll show you how easy it is give it a try both locally and on Heroku. "start": "node --harmony --harmony_generators server.js"
With this in place, you’re ready to run on Heroku— you don’t even need to add a Procfile. To run your app locally, use npm start. Do a search and you’ll find that most of the focus is on Koa’s use of generators, a feature that’s a part of the upcoming ECMAScript 6 specification. However, there are two other key features; cascading middleware and sane error handling. Getting a superficial awareness of how Koa uses generators will help in understanding its other features. Koa is built on co, which handles the delegation to generators and gives Koa its nice syntax. You can read about generators, co-routines, and the differences between them if you’re curious. or you’ve chosen one of the many paths out of callback hell. With the exception of the * and the yield keyword, this almost looks like a “normal” synchronous environment. Feels nice, eh? In this simple comparison it might not seem like a big difference, but if you’ve coded any real apps, you know how easy it is to get tangled in callbacks. Instead we need to use co-request; a “co-friendly” version that wraps request. You can find co- versions for many popular modules. To improve our response time, we should make these calls in parallel. Co (and Koa) have a really simple way to handle this; just yield an array or object, where each element of the array or property of the object is either a generator or a Promise. When Co encounters this, it triggers all the promises/generators at the same time, waits for the results to return, and keeps things in their correct order. You can imagine how short and sweet your web app route functions can become, even if they need to fetch data from a lot of different databases or APIs. The start variable holds a timestamp, the function then yields ‘downstream’ to whatever is passed in as next and when that function (and any functions it yields to) has finished, control is returned back to this function to calculate and log elapsed time. Rather than the Express way of carefully building up your HTML string through a series of Promises and callbacks and then finally passing it to res.send(), Koa allows you to append onto this.body, and when your middleware stack has gone to the bottom and back up, it sends the response off to the client. For more examples on ways to compose middleware, see the Koa guide. You might have noticed the lack of error handling in the example bits of code. That’s not actually an oversight. Whether you want a basic catch-all or granular control, Koa is your friend. Yes, that’s a bona fide try/catch block. You can call this.throw with any message and status code, and Koa will pass it along to the client. Although it will take some time for Koa and its underlying technologies to be stable and “production ready,” I have a feeling that Koa will catch on fast. Node’s async callback style is one of the biggest initial hurdles to adoption, and Koa is a pretty slick way to get around it. Will StrongLoop make use of Koa? StrongLoop is excited at the potential that Koa presents as a next-generation, lightweight web app framework. The LoopBack API Server currently utilizes Express for its web app functions like routing. What’s LoopBack? It’s an open source API server powered by Node, for connecting devices and apps to data and services. In the future, LoopBack may migrate from Express to Koa for web app functions like server side rendering, routing and web middleware, if the community and our customers ask for it. Want to learn more about Zones? Read Bert’s blog, get the code or watch the video presentation.